Known for his track record of delivering in derbies, Cristiano Ronaldo was hoping to repeat the trick for Juventus against Torino on Saturday night. The 33-year-old has been an instant hit for the Bianconeri, scoring 11 goals and providing eight assists in 20 appearances already this season. However, he seemingly left his shooting boots at home early on in the Derby della Mole on Saturday night, as seen in the video below. 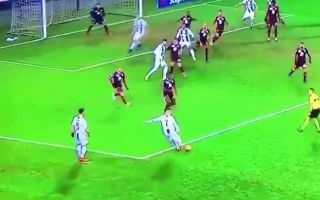 After Juventus were awarded a free-kick in a dangerous position, the ball was rolled into Ronaldo’s path to have an attempt at Salvatore Sirigu’s goal, but the Italian shot-stopper wasn’t called into action as the Juventus superstar horribly shanked his effort wide. It ended up going out for a throw-in for Torino, and so Ronaldo will undoubtedly be eager to forget this effort in a hurry and look to play a decisive role for the visitors as the game goes on. Juventus began the weekend with an eight-point lead at the top of the Serie A table, with Napoli not in action until Sunday when they face Cagliari.